Dr. Fakhry earned her medical degree at Johns Hopkins University, where she also completed her internship, residency and fellowship. 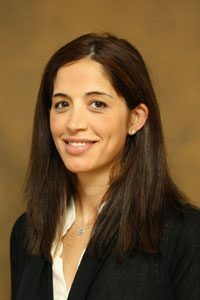 Dr. Fakhry serves as Assistant Professor, Department of Epidemiology, and Assistant Professor of Otolaryngology Head and Neck Surgery at Johns Hopkins University. OCF is pleased to have her as a science advisory board member and to be a financial co-sponsor of her work elucidating oral cancer epidemiology, HPV natural history, and innovative mechanisms for the screening and early discovery of oral and oropharyngeal cancers and identifying which cancer patients are at risk for extra capsular spread of the disease. 2005 – American Academy of Otolaryngology travel grant- Conference on Research Education and Training in Otolaryngology (CRETO). Dr. Fakhry explores HPV natural history, and is interested in the development of innovative mechanisms for the screening and early discovery of oral and oropharyngeal cancers. One of her current projects will identify which cancer patients are at risk for extra capsular spread of the disease. This is highly important in determining which patients will benefit from surgery vs. chemo-radiation therapies. Incidence and risk factors of HPV-related and HPV-unrelated Head and Neck Squamous Cell Carcinoma in HIV-infected individuals. Beachler DC, Abraham AG, Silverberg MJ, Jing Y, Fakhry C, Gill MJ, Dubrow R, Kitahata MM, Klein MB, Burchell AN, Korthuis PT, Moore RD, D’Souza G; On behalf of the North American AIDS Cohort Collaboration on Research and Design (NA-ACCORD) of IeDEA. Oral Oncol. 2014 Oct 6. pii: S1368-8375(14)00272-3. doi: 10.1016/j.oraloncology.2014.09.011. Tobacco use and oral HPV-16 infection. Fakhry C, Gillison ML, D’Souza G.
JAMA. 2014 Oct 8;312(14):1465-7. doi: 10.1001/jama.2014.13183. No abstract available. Pharyngocutaneous fistula after total laryngectomy: A single-institution experience, 2001-2012. Benson EM, Hirata RM, Thompson CB, Ha PK, Fakhry C, Saunders JR, Califano JA, Arnaoutakis D, Levine M, Tang M, Neuner G, Messing BP, Blanco RG. Transcervical Ultrasound Identifies Primary Tumor Site of Unknown Primary Head and Neck Squamous Cell Carcinoma. Mydlarz WK, Liu J, Blanco R, Fakhry C.
Otolaryngol Head Neck Surg. 2014 Sep 5. pii: 0194599814549181. [Epub ahead of print] No abstract available. The role of sexual behavior in head and neck cancer: implications for prevention and therapy. Rettig E, Kiess AP, Fakhry C.
Fakhry C, Zhang Q, Nguyen-Tan PF, Rosenthal D, El-Naggar A, Garden AS, Soulieres D, Trotti A, Avizonis V, Ridge JA, Harris J, Le QT, Gillison M.
J Clin Oncol. 2014 Oct 20;32(30):3365-73. doi: 10.1200/JCO.2014.55.1937. Epub 2014 Jun 23. Clinical, genomic, and metagenomic characterization of oral tongue squamous cell carcinoma in patients who do not smoke. Li R, Faden DL, Fakhry C, Langelier C, Jiao Y, Wang Y, Wilkerson MD, Pedamallu CS, Old M, Lang J, Loyo M, Ahn SM, Tan M, Gooi Z, Chan J, Richmon J, Wood LD, Hruban RH, Bishop J, Westra WH, Chung CH, Califano J, Gourin CG, Bettegowda C, Meyerson M, Papadopoulos N, Kinzler KW, Vogelstein B, DeRisi JL, Koch WM, Agrawal N.
The use of ultrasound in the search for the primary site of unknown primary head and neck squamous cell cancers. Fakhry C, Agrawal N, Califano J, Messing B, Liu J, Saunders J, Ha P, Coquia S, Hamper U, Gillison M, Blanco R.
Oral Oncol. 2014 Jul;50(7):640-5. doi: 10.1016/j.oraloncology.2014.03.015. Epub 2014 May 10. HPV and head and neck cancers: state-of-the-science. Fakhry C, Psyrri A, Chaturvedhi A. Oral Oncol. 2014 May;50(5):353-5. doi: 10.1016/j.oraloncology.2014.03.010. No abstract available. Transcervical ultrasonography is feasible to visualize and evaluate base of tongue cancers. Blanco RG, Califano J, Messing B, Richmon J, Liu J, Quon H, Neuner G, Saunders J, Ha PK, Sheth S, Gillison M, Fakhry C.
PLoS One. 2014 Jan 30;9(1):e87565. doi: 10.1371/journal.pone.0087565. eCollection 2014. Differences in oral sexual behaviors by gender, age, and race explain observed differences in prevalence of oral human papillomavirus infection. D’Souza G, Cullen K, Bowie J, Thorpe R, Fakhry C.
PLoS One. 2014 Jan 24;9(1):e86023. doi: 10.1371/journal.pone.0086023. eCollection 2014. The clinical impact of HPV tumor status upon head and neck squamous cell carcinomas. Benson E, Li R, Eisele D, Fakhry C.
Oral Oncol. 2014 Jun;50(6):565-74. doi: 10.1016/j.oraloncology.2013.09.008. Epub 2013 Oct 14. Transoral robotic surgery experience in 44 cases. Blanco RG, Fakhry C, Ha PK, Ryniak K, Messing B, Califano JA, Saunders JR.
J Laparoendosc Adv Surg Tech A. 2013 Nov;23(11):900-7. doi: 10.1089/lap.2013.0261. Epub 2013 Oct 1. Comparison of the immune microenvironment of the oral cavity and cervix in healthy women. Fakhry C, Marks MA, Gilman RH, Cabrerra L, Yori P, Kosek M, Gravitt PE. Cytokine. 2013 Nov;64(2):597-604. doi: 10.1016/j.cyto.2013.08.009. Epub 2013 Sep 7. Discussing the diagnosis of HPV-OSCC: common questions and answers. Oral Oncol. 2013 Sep;49(9):863-71. doi: 10.1016/j.oraloncology.2013.06.002. Epub 2013 Jul 19. Review. Long-term prognosis and risk factors among patients with HPV-associated oropharyngeal squamous cell carcinoma. Lin BM, Wang H, D’Souza G, Zhang Z, Fakhry C, Joseph AW, Drake VE, Sanguineti G, Westra WH, Pai SI. Cancer. 2013 Oct 1;119(19):3462-71. doi: 10.1002/cncr.28250. Epub 2013 Jul 16. The Effect of tumor subsite on short-term outcomes and costs of care after oral cancer surgery. Li R, Fakhry C, Koch WM, Gourin CG. Laryngoscope. 2013 Jul;123(7):1652-9. doi: 10.1002/lary.23952. Epub 2013 May 17. Distinct epidemiologic characteristics of oral tongue cancer patients. Li R, Koch WM, Fakhry C, Gourin CG. Otolaryngol Head Neck Surg. 2013 May;148(5):792-6. doi: 10.1177/0194599813477992. Epub 2013 Feb 8. Neck dissection through a facelift incision. Melvin TA, Eliades SJ, Ha PK, Fakhry C, Saunders JM, Califano JA, Blanco RG. Laryngoscope. 2012 Dec;122(12):2700-6. doi: 10.1002/lary.23386. Epub 2012 Sep 28. The effect of amifostine on submandibular gland histology after radiation. Junn JC, Sciubba JJ, Bishop JA, Zinreich E, Tang M, Levine MA, Palermo RA, Fakhry C, Blanco RG, Saunders JR, Califano JA, Ha PK. Int J Otolaryngol. 2012;2012:508279. doi: 10.1155/2012/508279. Epub 2012 Jul 15.